Even though The Mime Order, book 2 of 7 in The Bone Season series begins shortly after the end of the first book, I was very much confused by the first few chapters. The alternative universe of London that Shannon has skillfully created is so rich and intricate. I love that when I’m reading, I’m transported to Scion through Shannon’s words. It also comes with a lot of it’s own jargon and I found myself struggling to keep up. Shannon provides no overview of what happened in book 1 and just jumps right into the action. I appreciate that. I hate when authors waste pages upon pages explaining what happened in the pervious book. However, I should have probably reviewed the 1st book before I started this one but so little time and so many books. Paige Mahoney has escaped the brutal prison camp of Sheol I, but her problems have only just begun. All Paige wanted to do was to go home but things are never that simple. Paige sees London with new eyes. The clairvoyant community that she knows and loves isn’t exactly what it seems to be. There are dark secrets everywhere. To complicate matters Nashira Sargas, the blood-sovereign of the Rephaim (otherworldly race) is hunting Paige and now Paige is the most wanted person in London. But who can she trust? As with the last book, I am very much on the fence about this one. At times I thought this book was pure genius. Other times I felt it was convoluted. 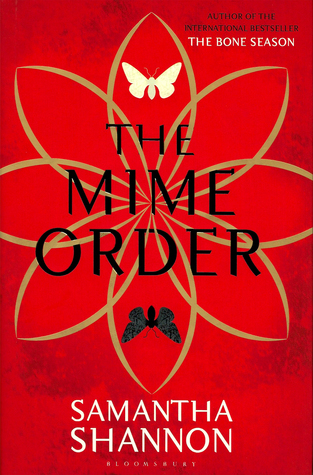 However, The Mime Order is a story of action, magic, criminals and a rising revolution. So basically it was a lot of fun, even thought it was a slow read at times. The final pages left me stunned and speechless. So basically, I cannot wait until the next book comes out. This entry was posted in Dystopian, Fantasy, Paranormal and tagged clairvoyance, dystopian, Paige Mahoney, Samantha Shannon, Scion, The Bone Season book 2, The Mime Order. Bookmark the permalink.